On another note, the treatment of orthographic "y" in Japanese transcriptions is also variable: some English speakers pronounce it as a vowel, leading to things like "tokey-o" and "kye-oh-to" for two big cities in Japan. A common misconception is that the haiku is a poem of 17 syllables in the pattern 5-7-5. A haiku actually contains 17 morae, not 17 syllables (unless it happens to be made up entirely of monomoraic syllables). Since English doesn't have the concept of morae, it's hard to see how the haiku format could meaningfully be applied to English poetry. @Pete: one might as well say that since English doesn't have the concept of morae (which determine "long" and "short" / "heavy" and "light" syllables in Latin or Greek, depending on "the length of time taken to pronounce each syllable"), it's hard to see how the iambic pentameter format could meaningfully be applied to English poetry. English haiku and Japanese haiku are not identical in form, sure: but there are clear parallels between what's called "haiku" in the context of Japanese and what's called "haiku" in the context of English. You're right, Philip - there are clear parallels so I suppose it still makes sense to apply the term in English. I was just being pedantic. Also, reading up on Wikipedia Mora (linguistics), it sounds as if there is some working definition of morae in English. Does anyone know more about this? How are morae defined in English and what is this concept used for? Is it? I had never noticed that. Also, is actually a geminated vowel followed by a geminated consonant impossible, even in compounds? @army1987: yes, in Japanese, geminated vowels followed by geminated consonants are impossible (outside of onomatopoeia and the like, which often has laxer phonological rules in many languages). And perhaps especially in compounds: (non-onomatopoetic) morphemes can't start with geminate consonants by themselves, and (to my knowledge) only do so in compounds if the first component has a "geminating" ending: usually an underlying -ku -ti -tu. There are doublets where a morpheme sometimes shows up with a long final vowel and sometimes with a geminater, such as 合 (gou- as in gougi "consultation" vs. ga'-/ka'- as in gasshoudan "choir" or kassen "battle") or 坊 (bou- as in bouzu "Buddhist priest, bonze" or bouya "boy" vs. bo'- as in botchan "son"). While I'm not sure of the exact significance of such pairs, to the best of my knowledge, long vowel + geminate consonant simply doesn't work, especially at morpheme boundaries. You do hear things like "tte iu to", where the part that should precede "tte" is omitted, effectively creating a geminate in the onset position. If the preceding word was a long vowel, say "ii", you'd get "iitte iu to". But this is across morphemes and it's not a compound. Oh dear. This sounds like a condition I've already seen in a few people and which I've coined xenolinguistic dyslexia: the inability to process foreign words causing the speaker to assume the most unlikely and most asinine pronunciation rules possible as a coping mechanism. 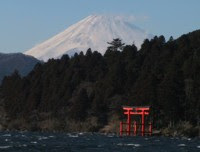 Pronouncing torii as /ˈtɔːriaɪ/ smells of stale monolingualism. I'd be surprised if the narrator ever saw a travel show, let alone an Asian. Catty? Perhaps. Lol. Most people know how to pronounce the name of the Nintendo Wii. There are Linnaean names adding a Latinate -i to a Japanese name ending in -ii, to give -iii. This page lists Tudicla ishiii, Coccophagus ishiii, and Semicytherura miii. How would Book at Bedtime handle those? No. Alexandre's 'iitte' is fine, tho it's not just across a morpheme boundary but across a word boundary. (I do have definitions for these things.) For a morpheme boundary one need look no further than Tookyookko "Tokyoite". Not using the macron for i as with the other vowels passeth all understanding, but may have had something to do with ii so often involving a morpheme boundary. It is not merely typographical: i macron is quite usual for romanization of katakana rather than the more morphological hiragana. It looks almost as if the kanji characters for torii (shall we say "bird perch"?) may originally have been some sort of joke, doesn't it ? They seem quite disrepectful for what it actually is. In LPD I give the usual anglicization, which is ˈtɔːriiː, though arguably ˈtɒriː would be a more consistent reflection of the Japanese pronunciation. I think your usual anglicization is fine, but ˈtɒri.i would be a more consistent reflection of the Japanese pronunciation than ˈtɒriː, and I feel ˈtɒri.i is what an honorary Japanese like me is actually likely to say. As we must, in order to be able to mark the accentual behaviour in terms of moras, unless IPA is to have the unwisdom to adopt polytonic Greek diacritics! But more to the point, so does Kunreishiki, the ill-starred Government romanization standard. And I should have said, "If Tookyookko freaks anyone out, what about Rondonkko 'Londoner'?" BTW John. I should also have said that your statement that the bimoraic nature of the long vowels "is reflected in the kana syllabaries, where they are written as a sequence of two characters" is a bit misleading, since it is only in the hiragana syllabary that they are consistently written with a vowel symbol as the second character, as in the examples you give. The katakana syllabary may represent them like that, again for morphological reasons, but the i macron which I say "is quite usual for romanization of katakana rather than the more morphological hiragana" actually reflects the use in katakana of a similar all-purpose length-marking symbol for all the vowels rather than doubling them. Sourced from Len Walsh 'Read Japanese Today'. Radii is only pronounced that way if you are pronouncing it as English. The long I doesn't make that sound in Latin so a Latin 2nd declension noun does not sound like that at all. While there are some differences of course, Latin vowels are actually quite similar in pronunciation to Japanese vowels. Latin vowels are actually quite similar in pronunciation to Japanese vowels. if English had borrowed the word torii seven or eight hundred years ago.